The place is very quiet and clean. Amenities include fridge and microwave which is very convenient. I would stay here again for any future trips in the area. An amazing spot for relaxing- had everything we needed and more. A puddle of sunshine then warm fire, super big dining table to enjoy dinner then the papers the next morning. Host responsive and helpful. Where to find Kaladar hotels near an airport? Where can I find hotels in Kaladar that are near tourist attractions? Expedia's up-to-date Canada hotel database offers 5 hotels within a 0.1-kilometre (0.06-mile) radius of Kaladar. The nearest Expedia hotel is the Fernleigh Lodge, Ontario, located 25 kilometres (17 miles) from downtown Kaladar. Another convenient alternative is the Gull Lake Cottages and Campground, which is located in Ontario, which is 18 kilometres (11 miles) from the middle of Kaladar. The Fifth Lake Cottages as well as the The Park Place Motel are hotel options to investigate. 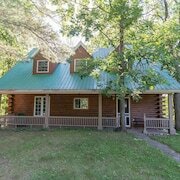 The Fifth Lake Cottages is situated 20 kilometres (13 miles) from downtown Kaladar. 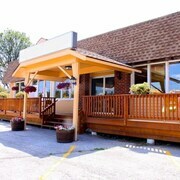 The The Park Place Motel can be found 25 kilometres (15 miles) away. 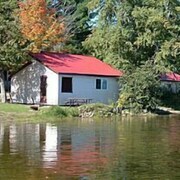 The Trudeau's Park Lodge is situated 25 kilometres (14 miles) from downtown Kaladar and is another worthy alternative. After you have got to know Kaladar, set out visit more of the Ottawa - Southeastern Ontario area. Ottawa - Southeastern Ontario is marked by forests, rivers, streams and lakes, and commonly visited Ottawa - Southeastern Ontario attractions include old towns, art museums and nature museums. 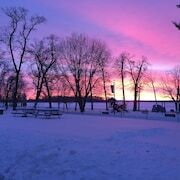 Common pastimes in this part of Canada include cross-country skiing, snow shoeing and snowmobiling. 75 kilometres (48 miles) to the south of Kaladar you will find Picton, where you can find Sandbanks Provincial Park and Picton Golf and Country Club. Should you wish to spend a few nights in Picton, be sure to check out the The Waring House and Sandbanks Summer Village Cottages. Or, you could consider staying in Smiths Falls, 90 kilometres (57 miles) to the east of Kaladar, where you'll find the Econo Lodge and Best Western Colonel By Inn. The Heritage House Museum and Rideau Canal Museum are some of the most popular points of interest to experience when visiting Smiths Falls. Before you leave Ottawa - Southeastern Ontario, why not make sure you catch some local sport. Visit Yardmen Arena to the south of Kaladar. For visitors who are interested in booking accommodation nearby, make a reservation in the Fairfield Inn & Suites by Marriott Belleville or Best Western Belleville. If you are planning on arriving or departing through Norman Rogers Airport, you can stay at Travelodge Kingston LaSalle Hotel, or Bayside Inn & Waterfront Suites, both of which are a short distance away. Are there hotels in other cities near Kaladar? What other types of accommodations are available in Kaladar? Explore Kaladar with Expedia.ca’s Travel Guides to find the best flights, cars, holiday packages and more!